Digitalis is a genus of about 20 species of herbaceous perennials shrubs, and biennals that are commonly called foxgloves. The genus is native to Europe, western and central Asia, and northwestern Africa. 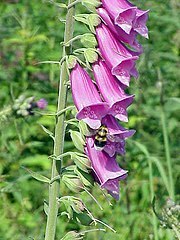 The term digitalis is also used for preparations containing cardiac glycosides, particularly digoxin, extracted from plants of this genus. This page was last changed on 26 September 2013, at 04:28.